Two new QB’s will take center stage Sunday as the Cardinals with John Skelton play host to new Seattle QB Russell Wilson in a week one NFC West showdown. It will be interesting to see how the two QB’s fare, as a lot of eyes will be on Wilson, who is undersized by NFL standards, at 5-foot-11. Wilson completed 63.5 percent of his throws during the preseason and finished with five touchdowns and one interception. He also rushed for 150 yards and a score. Skelton beat out Kevin Kolb, but you can bet that Kolb is going to see the field at some point in 2012, that just seems to be the way it’s gone in Arizona since Kurt Warner has retired. Skelton had a 50.6 passer rating to Kolb’s 49.7 in the preseason, meaning that both QB’s showed little, which is why both will at some point see action this season. Seattle under Pete Carroll have issues finding players to catch passes from the rookie Wilson. Veterans Braylon Edwards and Terrell Owens to bolster its receiving corps, but only Edwards made the team. Sidney Rice’s return from a season-ending concussion in 2011 and two offseason shoulder surgeries could give Wilson or Flynn another downfield option, though the Seahawks also will look for contributions from returning wideouts Doug Baldwin, Golden Tate and Ben Obomanu. Seattle will have a rough time if Marshawn Lynch, who has been having back issues, isn’t able to go to give the Hawks some type of running game. Arizona’s D will look to confuse Wilson in his first start, but the burner has shown already that he has the speed to make up for what he doesn’t have in the passing game, and you can look for his feet to make an impact. The Cards are hoping to see plenty of carries from Beanie Wells and Ryan Williams, who both return following knee surgeries. Wells ran for 1,047 yards and 10 TDs last season, while Williams missed his rookie year with a torn tendon in his right knee. With two young QB’s, the ground game will be important, and with Lynch hopefully playing and Wilson using his feet, I like what the Hawks have to offer just a bit more than Arizona. 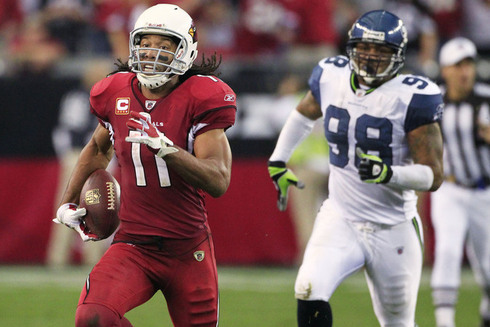 Seahawks at Cardinals – Who Wins This Week One Matchup?